Also known as Arunachaleswar temple, this important pilgrimage place represents one of the five cosmic elements, in this case fire, and sprawling across 10 hectares in Tiruvannamalai. This temple is considered to be very auspicious by Saivites, as a place must to be visited once in their life time. Lord Shiva is represented as a column of fire in this temple called as Agni Lingam. Mythologically, when there was a clash between Lord Brahma and Lord Vishnu about their supremacy, they surrendered to Lord Shiva. He challenged them to find his head or his feet as a test and they both accepted that whoever was successful would be deemed superior. Brahma moved upward and Vishnu went downwards. After a long time, Vishnu could not find the feet of Shiva and gave up, coming back and accepting that he was not superior. But Brahma reappeared with a flower, stating that he had taken it from the crown of Lord Shiva. Shiva called him out on his deception, and laid a curse that Brahma would never have any temple dedicated to him on earth (this was later rescinded, but even now there are only 2 Brahma temples, compared with countless thousands dedicated to Vishnu). Lord Shiva is worshipped in the form of a column of huge fire which is an endless phenomenon. There has been a temple at this site for millennia, but the main structures you see today were begun around the 9th century CE during the early part of the Chola dynasty and has seen vast expansions and maintenance during the centuries since. 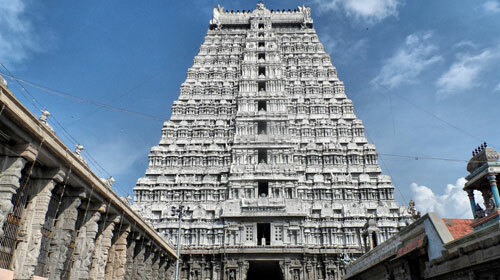 The temple complex sprawls over more than 10 hectares and is located at the foot of the sacred mountain, Arunachala, which is the embodiment of Shiva. It comprises of many shrines, out of which the shrines for Lord Annamalayar and Goddess Unnamalaiamman being the prominent. The temple has many festivals celebrated throughout the year, out of which the most renowned Karthigai Deepam is of special religious significance. The presence of Lord Shiva in the form of huge column of fire is symbolized by the celebrations on this day during the Tamil month Karthigai, that is, between mid-November and mid-December. The highlight of this event is the lighting of a massive ghee lamp atop Arunachala. Devotees come and give offerings of ghee- up to 3 tonnes is carried to the top of the hill and lit as the full moon rises on the day of Deepam. The light from this cauldron is visible from many kilometres radius. From the inscriptions, it can be inferred that celebrating Karthigai Deepam has been in place since the 8th century. To mark this event, the processional deity of the Lord Annamalaiyar is taken on circumambulation around the hill. Yet another religiously significant event in this temple is Girivalam. On any given day you will see hundreds of people performing the ritual circuit of Arunachala, but each and every full moon day, this number swells to tens of thousands, and at Deepam the number is well into 6 figures. Over one million people annually walk around Arunachala. It is an event of enormous importance and one of the great rituals of life for South Indian Hindus. Other than the temple, Tiruvannamalai is home to many ashrams where Indians and foreign seekers come for the process of the self-realisation and inner peace. Come and experience the divinity in every aspect of Tiruvannamalai and be blessed by Lord Annamalaiyar.